CAD Pockets also supports offline usage. Simply by saving files into your iOS device and you are free to go. Moreover, you can view files that have been downloaded to your cloud drive without access to the Internet. Support both 2D and 3D DWG/DXF/DWF files. Open and save CAD files from local storage, online storage (DropBox, GoogleDrive, OneDrive, etc. ) and email attachment. 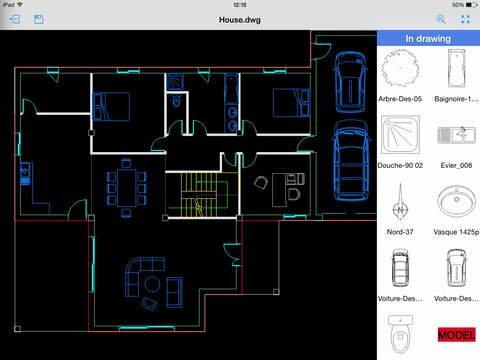 Transfer CAD files via iTunes for local drawings, and support full offline usability (Open, Rename, Save as, Delete and Share). Supports auto-sync and remote operations (Open, Rename, Save as, Delete and Share) for remote CAD files. Supports auto cache for remote CAD files, which allows users to open and delete them offline. Manage WebDav sites (Create, Delete, Modify and File Sync). 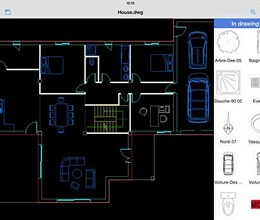 Share CAD drawing via Email and export drawing to JPG/PDF/DWF. Supports easy-to-use multi-touch operations for Zooming, Panning and Snapping. Supports CAD drawing functions like Lines, Polylines, Circles, and Texts. Supports CAD editing functions like Copy, Move, Rotate and Mirror. Supports CAD annotating functions like Revision cloud, Dimension, Image and Voice. Supports CAD dimensioning functions like Linear, Radius, Angular and Ordinate. Supports block insert and editing block attribute. Supports magnifier for details, and prompt for “Last Point”. Supports CAD layer and layout management. Supports 3D viewing and view control. Supports Find Text function and automatically locating the result. * CAD Pockets download link provides freeware version of the software. No one has rated CAD Pockets yet. Be the first to rate this product.